Forty years after the main explosion, in 1927, Volcanic activity was seen in the sea covering the old caldera, between the sites of the two northernmost former volcano of Anak Krakatau Volcano, where the greatest activity had occurred at the time of the cataclysm. A series of eruptions 185 m below the surface of the sea resulted in the emergence of three new island, one after the other. They were all soon destroyed by surf. A fourth emerged from the sea on august 12th 1930.it remained above eater, and was aptly named Child of Krakatoa (Anak Krakatau). 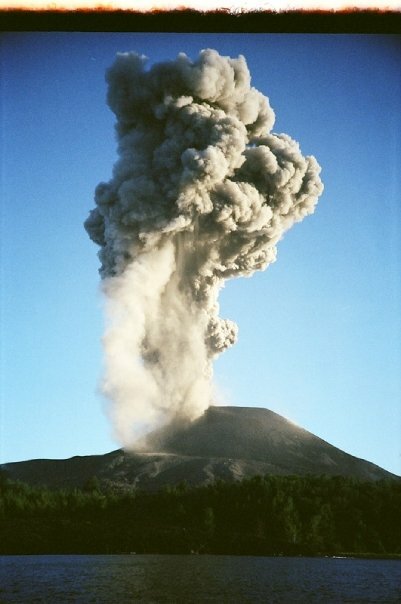 It grew by the accumulation of ash, and suffered a devastating eruption in 1927. It is now 300 m high and 2 km in diameter, and is still active. The northeast coast, north fore land and east fore land are now vegetated the succession of vegetation is still at an early stage, "Casuarina Equistifolia (Cemara)" being the dominant tree.